Samsung Galaxy Grand 2 is running on the rather low-consumption Snapdragon 400 chipset with four 1.2GHz low-powered Cortex-A7 processor. 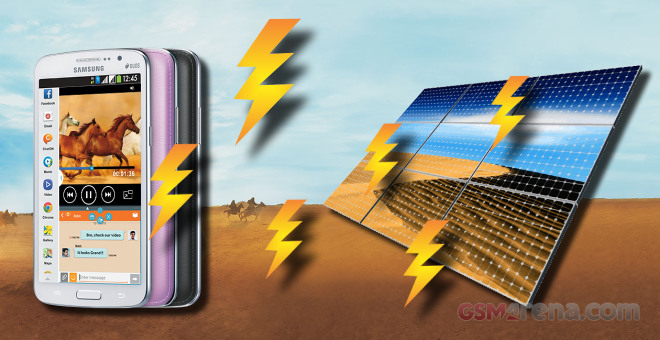 Even though the SoC may save you some power juice, the big 5.25″ screen estate that has to be lit up won’t be generous with the 2,600 mAh battery. Now that our review is live on our homepage, we are also ready to share the full breakdown of our dedicated battery endurance test. First, we’ve put the Galaxy Grand 2 on a call with another device. Naturally the screen was turned off, so we’ve expected pretty much great numbers. Note that even though both SIM slots were occupied by active SIM cards only one of them was actually in a call. This explains the amazing endurance of almost 20 hours here. Our second routine tests the web browsing battery endurance. The Galaxy Grand 2 went for 9 hours and 5 minutes before its battery went flat. This might not be an amazing achievement, but it is an excellent one for a device with such a big display. Finally, we’ve run a looped video on the Galaxy Grand 2 and its 2,600 mAh battery managed 8 hours and 41 minutes before reaching 10% capacity. Samsung Galaxy Grand 2 did great on all three battery tests, but failed under stand-by mode, which brought its overall rating down. It isn’t unexpected since we’ve equipped the Grand 2 with two SIM cards, but still we hoped for lower stand-by draw. 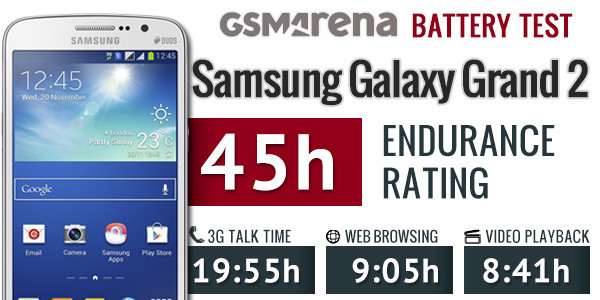 Anyway, due to its low stand-by performance, the final endurance rating for the Samsung Galaxy Grand 2′s battery is 45 hours. This means you’ll have to recharge your phone every two days if you are using the smartphone for an hour of web browsing, an hour of video playback and an hour of 3G calls each day. We are pretty much sure the single-SIM models (including the LTE one) will do better on stand-by thus providing you with even longer power autonomy.